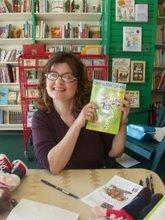 Barbara Bietz, kidlit blogger, incoming member of the Sydney Taylor Book Award Committee, and author of Like a Maccabee, interviewed me for her blog! Click here to read the interview. Keep up with Barbara Bietz at http://www.barbarabietz.com/ or at barbarabbookblog.blogspot.com. As you may know, in addition to hosting The Book of Life I am also a Judaica children's librarian. I was so pleased when MyJewishLearning.com asked me to write an article for their web page about Contemporary Jewish Youth Literature! The article discusses recent trends in Judaic literature for kids and teens. Click here to read the article, and please post a comment to let me know what you think, or to suggest additional titles! In this episode of The Book of Life, a show about Jewish people and the books we read, we celebrate Thanksgiving with a special bonus episode! > We hear from Todd Herzog, a Jewish musician/singer/songwriter from Phoenix, Arizona. Todd's spiritual pop music has a thankful quality about it that fits in well with Thanksgiving. Also check out Todd's MySpace page. > We meet Maryann Kovalski, illustrator of the award-winning picture book Rivka's First Thanksgiving by Elsa Okon Rael. > We learn about the Library Blogathon at the Feldman Children's Library (home base of The Book of Life). If you are a fan of books and libraries, you need to check out this blog! Available beginning November 21, 2007. > Throughout the show we send shout-outs to various listeners who have sent in their comments and feedback to The Book of Life during the year. Do YOU have something to say? Be sure to email us at bookoflifepodcast@gmail.com! Background music is provided by The Freilachmakers Klezmer String Band. Additional background music for this episode is provided by Brian Smith at The Laughing Librarian's "BibDitties" (copyright 2006).